if there is radiation fibrosis the trachea should be deviated towards the same side. doesnt seem to be in pic given. again i would say immunocompromised can have tb even in u.s. and so also anergy to tuberculin test. history is classic for tb hemoptysis, cough and lung change which are extensive. Good though provoking – a negative TB skin test should be repeated in 3 wks, but latent TB can produce complications like pleural effusions but not be infectious to others, a type II Hodgkins – more than one lymph node area, can respond to chemo and radiotherapy with high 10 yr survivabilities – around 80-90%..Those that don’t respond to initial radiation may be curable with chemo according to the texts, and some prefer stem cell transplants that according to CMDT have 35–50% chance if chemo sensitive….the answer is unlikely to be radiation related since the chief complaint seems to me to be unrelated to the PMhx, I found it helpful to see the symptoms of presentation, then signs, then tests to tell what is the main diagnosis. just a generalist but.hopefully helpful to others. Long term sequel of hodgkin therapy : Does the patient needs long term maintenance therapy ? question did not mention that . Im not sure . We are left with recurrent hodgkin . Im Stil confuse : the white out on the x ray picture : Pleural Invasion by cancer cell ? 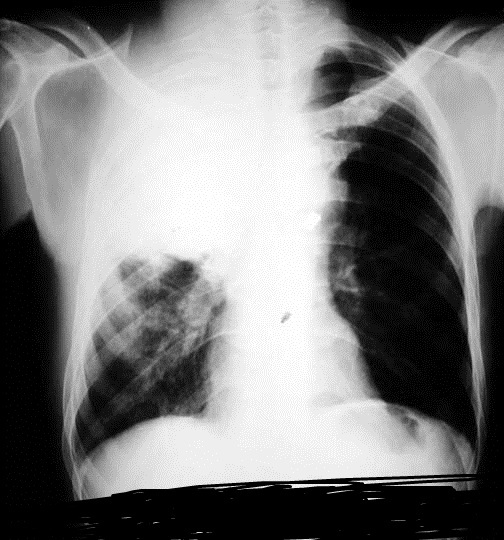 CXR – shows an opacity. Is it lung tissue or something else? There is no air bronchogram sign meaning it is solid as liquid or rock but it is not lung tissue because there is no air filled alveoli in the opacity. This is not pneumonitis, TB, or lung fibrosis (Fibrosis in the lung causes RETICULO-nodular shadow, there is always air in lung tissue on cxr) Additionally, the trachea is not pulled to the side of the opacity as might have occurred if this were a fibrosis. So I feel option (a), (d), & (e) are unlikely. This is a solid mass. Is it chest lymph node or thymus? It could be relapse of Hodgkin’s lymphoma or a secondary cancer. A secondary cancer is a new cancer, which has higher incidence in patients who received radiation therapy at a young age( like this patient). Even though this has a high probability of been a relapse of Hodgkin’s lymphoma, I feel it is safer to call it long term sequel of Hodgkin’s therapy until there is biopsy confirmation. Only biopsy can label this solid mass as Hodgkin’s lymphoma. This is a Lab diagnosis. I think answer is B. she has consolidation of rt upper lobe, weight loss, hemoptysis, ppd negative, ho of radiation to chest. I think it is CA lung with consolidation.